ConnectCode, a world leading provider of invoice software and apps, today announced the release of Invoice 360 Enterprise, an invoice system that consists of an extremely easy to use self-hosted invoice cloud server on the Windows Desktop and invoice client app (Universal Windows Platform) that syncs data with the server. The easy to use self-hosted invoice cloud utilizes modern cloud syncing design and architecture, and provides many benefits such as business continuity over traditional systems. The client app runs uninterrupted even when the cloud server or network is not available. The client app automatically caches all the performed actions and stores the data locally while waiting for the server to be available so that a sync process can take place. This provides significant advantage to people on the go. A sales person can bring a device containing the invoice client app out of office to invoice a customer without worrying about connectivity. When he is back in office, he can sync the data on his device with the cloud server easily. With a locally self-hosted server, business owners are assured that their data is stored on premise and do not have to worry about losing control of their sensitive business information. A self-hosted server also ensures that there is no subscription costs. Over time, many businesses have come to realize that a free cloud subscription for an invoice application from a third-party company is attractive in the beginning but worrying in the longer term. These businesses constantly worry about being charged a subscription fee in the future; whether they will be provided with reasonable service level; and whether they will be held hostage by third-party companies in case there is a dispute over costs or services provided. And most importantly whether their business information is well protected and not secretly shared with other companies by the third-party company offering the invoice application. 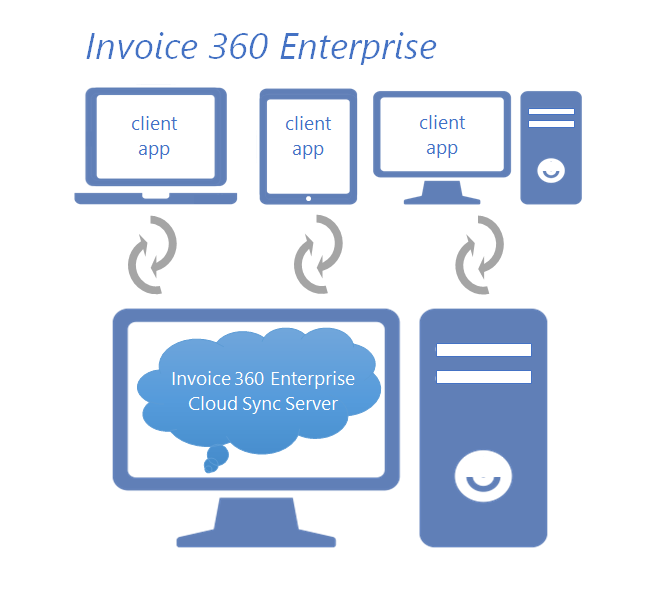 Invoice 360 Enterprise offers unmatched flexibility in the deployment of the cloud server. Besides providing a locally self-hosted Windows Desktop executable to business owners, Invoice 360 Enterprise also offers the source code of the cloud server on GitHub. Organizations with the necessary IT expertise, can choose to host the open source server on well-known cloud providers such as Azure by Microsoft with their personal cloud subscription, keeping their data confidential and away from the hands of third-party companies. Ever since the launch of Invoice 360, it has become one of the most popular invoice app on the Windows Store. Invoice 360 Enterprise is a huge step up from Invoice 360. It utilizes the same user interface, perfected over many iterations with feedbacks from many users over many years, on the client app as Invoice 360. Invoice 360 Enterprise allows users to design stunningly beautiful invoice templates and use the templates on invoices, quotes and estimates through a full-fledged WYSIWYG invoice template designer. An invoice template gallery with many invoice templates targeting many different industries is also available online. Attention publisher: You may edit our press release as necessary for your publication. ConnectCode, a world leading provider of invoice and barcode software, today announced the release a new version (v3.0) of Invoice 360 that embraces Microsoft's Universal Windows Platform (UWP). By adopting Universal Windows Platform, Invoice 360 can run on PCs, tablets, phones, internet of things devices and Xbox One consoles. This version targets PCs and tablets with the mobile version to be ready later this year. Invoice 360 is one of the most popular invoice app designed from the ground up for small businesses on the Windows platform. It allows users to design stunningly beautiful invoice templates and use the templates on invoices, quotes and estimates. The app comes with a full-fledged WYSIWYG invoice template designer on Windows Desktop and an invoice template gallery with many invoice templates targeting many different industries. An in-app PDF (Portable Document Format) engine is also available to generate PDF invoices without a need to install third-party PDF printer drivers or plug-ins. Invoice 360 supports full invoice, quote, estimate, customer, inventory and payments capabilities. Flexible tax structures, currency settings, discounts and shipping charges can be setup easily. The data in Invoice 360 can also be easily exported with a few simple taps to a spreadsheet for accounting and reporting purposes. This version of Invoice 360 also introduces the Beta for the Invoice 360 Cloud Sync. Invoice 360 Cloud Sync is a free and open-source invoice system based on the Invoice 360 app that supports cloud syncing and easy self-cloud-hosting. Using Cloud Sync, the Invoice 360 app can operate locally on a device without a network connection and syncs data with the cloud when a connection is available. The cloud data serves as a backup and ease transferring data to different devices. The server cloud is open source and is kept as simple as possible for ease of self-hosting without requiring tedious maintenance. ConnectCode, a leading barcode and invoice software provider, today announced the release of a new version (v2.6) of the popular and award-winning Invoice 360 app on the Windows Store. This new version comes with enhanced user interfaces, archiving support, productivity capabilities such as duplicate inventory and new search options in the History screen. The item description in an invoice can now be flexibly indented with a simple setting, a feature widely requested by many users. Survey and statistics have frequently shown that beautiful branded company collateral leads to increased brand recognition. Invoice 360 allows the invoice templates to be fully customized through an Invoice Template Designer. This allows users to create stunningly beautiful invoices for better brand recognition. An invoice template gallery, providing ready-made templates, is also available on Invoice 360 website. These templates can be easily imported into Invoice 360 or further edited with the Invoice Template Designer. Invoice 360 offers an elegantly simple user interface. The app itself looks like an invoice and allows users to easily change the different information by tapping on the different parts of the app (invoice). During invoicing, the items in a customer's previous invoice can be easily retrieved with a single tap of a button. A quote in Invoice 360 can also be easily converted into an Invoice. All these capabilities brings about increased productivity and efficiency in the invoice workflow. Many businesses rely on Excel spreadsheets or third party software for accounting purposes and for keeping track of such information. Invoice 360 offers two way integration where a user can easily import customers/inventory data from an Excel spreadsheet and export all invoices and information stored in Invoice 360 to an external spreadsheet. Instead of requiring businesses to fit into the workflow of Invoice 360, the app provides capabilities to fit into the business workflow of the user. ConnectCode, a leading automation software provider, today announced the release of a new version (v2.1) of the free, extremely popular and award-winning Invoice 360 app on the Windows Store. Since the first release, the development team has listened very carefully to users’ feedbacks and implemented many new features to improve Invoice 360. The team also work hard to ensure the app adheres strictly to its key design principle of being Elegantly Simple to use. The new features include invoice creation based on items used in the last invoice, importing of Customer information from Microsoft People's app and exporting of the invoice database to an Excel spreadsheet for accounting/reporting purposes. Country specific features such as support for Swiss Franc with 5 Rappen rounding, Pakistani Rupee and Australian nontaxable inventory item have also been added. A new Reset function enables the removal of demo data and setup of a new Company in one simple step. Invoice 360 supports the customization of invoice templates through a Free Invoice Template Designer on the desktop. This capability is a true differentiator and has allowed users to create stunningly beautiful invoices. An Invoice Templates gallery is now available for users to simply download and make use a template immediately. This further enhances the app's ease of use. The latest version of Invoice 360 is optimized for Windows 8.1. The user interface takes advantage of the many performance improvements in Windows and is more responsive than the previous release. The app also supports all the different Windows 8.1 screen sizes and the new Windows Side-by-Side View. Besides being easy to use, Invoice 360 is also a holistic end-to-end software that supports quotation, estimates, invoice payments tracking, historical records searching and customers/inventory management. Invoices generated by Invoice 360 can be printed on any Windows supported printers, generated as PDF, shared or emailed to customers. Flexible tax structures such as inclusive tax, exclusive tax or accumulative tax can be setup easily. With these full-fledged capabilities, Invoice 360 is definitely the industry leading invoice app on the Windows Store. ConnectCode, a leading automation software provider, today announced the release of a new version (v1.1) of the popular and free Invoice 360 app on the Windows 8 Store. This new version adds many advanced capabilities such as multi-page invoice printing, multi-line invoice items and optimized support for display with high definition. The app which already supports invoicing in many western languages, now also supports Asian languages such as Japanese and Chinese. The existing version of Invoice 360 provides a comprehensive set of invoice templates and a Free Invoice Template Designer on the desktop. This new version further enhances the template customization capabilities, allowing users to specify multi-line invoice item description. Users can specify specific line breaks and have better control of how their invoice items are displayed to customers. The new version also adds multi-page invoice printing. The previous limitation on 10 invoice items is removed and a separate invoice page is generated to accommodate all the items. All existing invoice templates, including customized templates, support multi-page invoice printing. This new capability also extends to PDF (Portable Document Format) documents generated by Invoice 360. The existing version of Invoice 360 is already available in the Windows Store of many western countries such as United States of America, United Kingdom, Australia, France, Germany, Italy, Spain and many more. With the support of Asian languages, it is now made available in many more countries such as Japan and China. Invoice 360 is an invoice app designed from the ground up with a focus on elegantly simple user interface. Besides being easy to use, it is a holistic end-to-end software that supports full invoice, quote, estimate, history, customers, inventory and payments capabilities. Flexible tax structures, discounts and shipping charges before or after tax can also be setup. The generated invoices can be printed on any Windows supported printers, generated as PDF, shared or emailed to customers. Stunningly beautiful invoices can also be created using the Invoice Template Designer which is available on the Windows Desktop. With these full-fledged capabilities, Invoice 360 is definitely one of the industry leading invoice app. ConnectCode, a leading automation software provider, today announced the release of a free Invoice 360 app on Windows Store that enables customizable invoices to be created and printed on Windows 8 Operating System. Invoice 360 is an invoice app designed from the ground up for people on the go. The user interface is elegantly simple and easy to use while allowing users to create stunningly beautiful invoices quickly. Invoicing a customer is a matter of a few seconds requiring only 3 simple taps on the screen. The generated invoice can be shared through Email, Microsoft SkyDrive and printed on any printers supported by Windows. Furthermore, the app has an in-app PDF (Portable Document Format) engine to generate PDF invoices without a need to install third-party PDF printer drivers or plug-ins. The app comes with a set of professional invoice templates to choose from or to customize. This enables most users to get started immediately. A free Invoice 360 Template Designer, on the desktop, for people who would like to design their own invoice template instead of leveraging on existing templates, is also available. There is a seamless integration of the Invoice 360 app and the Invoice 360 Template Designer that enables newly designed invoice template to be ready for use on the app easily. Though Invoice 360 is designed for people on the go, it is also a holistic end-to-end software that supports full invoice, quote, estimate, history, customers, inventory and payments capabilities. Flexible tax structures, discounts and shipping charges before or after tax can be setup easily. Existing invoices can be retrieved through the advanced search feature. With a 360° view of business information at the finger-tips, a user can stay on top of things while dealing with customers on the go. Invoice 360 runs on Windows 8 and is designed for use on both touch screens and for use with a keyboard and mouse. The Invoice Template Designer runs on Windows XP, Windows Vista, Windows 7 and Windows 8 as a Desktop application.